MALVERN HALL is a former stately home just east of Solihull parish church in Warwickshire. It is probably the most well know surviving building bearing the name Malvern which was a locality that originated from the medieval Malvern Farm. The local church, Saint Alphege's, was founded in 1220 albeit building started in 1180, at a time when the area was being developed for farming. 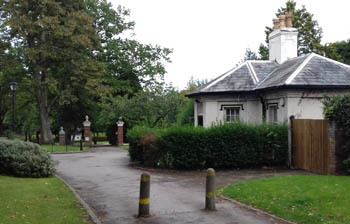 Other significant buildings that are designated Malvern include Malvern Park Farm, also known in part as Witley or Whitely and Malvern House. The late 16th century Park Farm house lies about half a mile south of the parish church. Malvern House lies east of the church between the church and Malvern Hall. Malvern Hall comprises an early 18thcentury stone mansion that over the years has been much altered. It lies in landscaped grounds that are the principal surviving area that bears the name Malvern. Former occupants whose coats of arms are displayed on the entrance gate posts are Lewes, Greswolde and Tollemache. The history of Malvern Hall has been extensively researched and the local library in Solihull has many useful documents in its collection. The Greswold(e) family have been associated with the Solihull area certainly since the 14th century and were closely associated with Yardley, to the south of Birmingham. Then in 1680 the Rev. Henry Greswolde (1628-1700), rector of Solihull, bought a large land area called Malvern Farm to establish a family seat. At the time Malvern Farm was the property of Job Murcott. Humphrey Greswolde (1671-1718), the rector's son, built a substantial brick dwelling Malvern Hall on the land some twenty or more years later commencing in 1702 with work still in progress as late as 1706. Humphrey Greswolde became High Sheriff of Warwickshire at this time. Left - St Alphege's parish church. This started a prolonged period of Greswolde occupation and further development of Malvern Hall and estate over two hundred years. In 1749 the estate passed to David Lewes, a branch of the Greswolde family by marriage. In order to perpetuate the name Greswolde, the name was thereafter added to the various family names of the inheritees to provide continuity of use. The year 1784 saw substantial remodelling of the existing house with wings being added. Meanwhile the grounds were developed over a prolonged period of time resulting in an arboretum of some note which lives on to the present day. Amongst many other improvements over the years, new iron gates were installed between the entrance pillars in 1811. Around this time the estate was in part stocked with deer and an avenue of trees erected at the entrance to mark the victory at Waterloo. The Greswolde family over the decades underwent various traumas and marriages that ended with difficulty. The problems included insanity and manipulation of inheritances. Constable the artist stayed at Malvern Hall on occasions and painted several views of the estate. There was even an alleged family ghost in the mid-19thcentury. In the end, Francis Wigley Greswolde Williams auctioned and sold Malvern Hall to David Troman/Solihull Council in 1896 having inherited it in 1875. The estate was described at the time as of 148 acres with ornamental grounds and deer park, together with various buildings in addition to the 'Family Mansion'. In all there were 23 lots and the many buildings required a judicious outlay to return them to original beauty. Malvern Hall remained the property of the Tromans until 1915. It was then sold to Horace Brueton who was a great local benefactor. Following World War 1 the estate fell into further decay and the owner moved to a modern dwelling nearby. Eventually sixteen acres was sold off to the Rural District Council for a public recreation ground and Malvern Park was duly created and named. Right - Greswolde Arms dated 1599 in the parish church. Solihull High School for Girls opened in 1931 in Malvern Hall. With the assistance of Horace Brueton, some of the fragmented landholdings that were once part of the overall estate were consolidated and returned to form a single unit. Others have been developed for residential accommodation and roads over the centuries. The Hall has made a fine setting for a centre of education with its associations with Constable and Sir John Soane who had participated in the early years remodelling. By 1961 there were 630 girls at the school including a sixth form of 130. Further additions to the buildings have made this possible leaving the original Greswolde building as the central focus. This brings us up to what can be observed today; a former stately home given a modern day educational role together with its estate and heritage. So what were the origins of the Malvern name? It is known that Malvern Hall was originally built on land that formed part of Malvern House estate until 1680 when it was purchased by Greswold. Also Whitley Farm formed part of the Malvern House estate but was separately occupied until the formation of the deer park when it was integrated into Malvern Hall estate in the early 19th century. Malvern Hall estate was therefore created from the earlier Malvern House estate. MALVERN HOUSE ESTATE - As stated above, Greswold purchased his Mavern Hall estate in 1680 from Job Murcott. Murcotts had acquired the Malvern House estate from a John Aglionby in a series of transactions circa 1656/7. Malvern House was recorded on the estate in 1658. In 1668/9 it was also recorded that a newly erected windmill was on the Malvern House estate at a point known as Malvern Hill (the old windmill had burnt down). Aglionby earlier had purchased the Malvern House estate from Robert Lord Brooke of Beauchamp's Court, Alcester in the year 1638. Richard Pittes is recorded here in 1611, where he is described as a pauper of Malvern. Picture left - Malvern Park, a public recreation ground past the former lodge of Malvern Hall. Brooke's ancestry was Faulk Greville. This links him to Sir Richard Lygon of Madresfield Court, Great Malvern who married Margaret Greville in the 15th century and an earlier Faulk Greville who about the same time married Elizabeth Willoughby and through her he acquired the afore mentioned Beauchamp's Court. 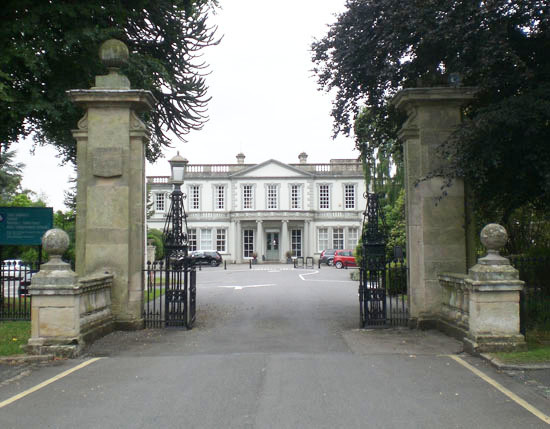 Madresfield Court, Great Malvern, Worcestershire is a country house. The house has been the home of the Lygon family for nearly six centuries, and has passed only by inheritance since the 12th century. 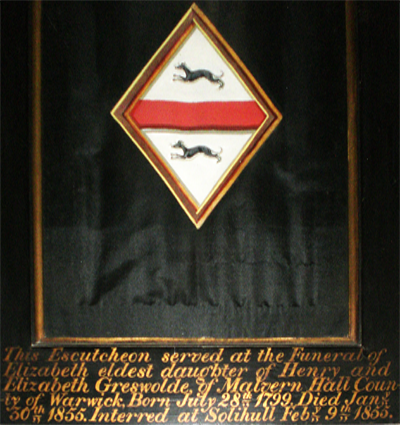 The title Earl Beauchamp was passed down the Lygon family inheritors. Both the Warwickshire and the Worcestershire Malvern's appear to have roots with the same ownership source, the Beauchamp's. Is this a clue to the evolution of a second Malvern in England? The root location named 'Malvern' Warwickshire is the medieval Malvern Farm. Malvern House including its former estate. Malvern Hall and Malvern Park Farm have originated from the original estate. 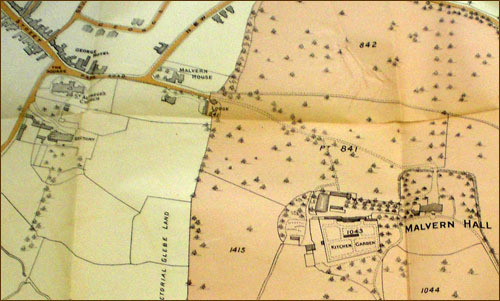 The location of the present Malvern House is shown on the 1915 map above on the north side of Park Road between the parish church and the Malvern Hall lodge. The present building is Grade 2* listed and is believed to incorporate elements of an earlier mid 17th century structure. In addition there are 19th century additions on the side and rear. It was once The Old Grammar School. 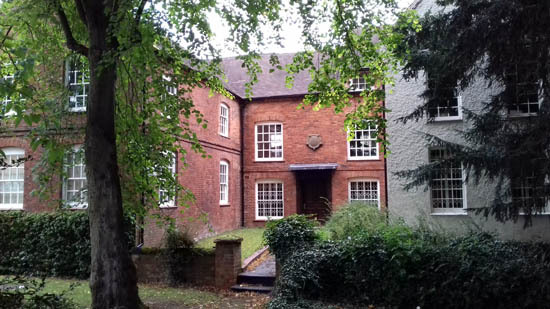 Solihull School moved to this site in a house in 1615. It stayed here until 1882 when the school moved to School House on the current 50 acre site of Solihull School. The school had existed since 1560 in the Parish Church of St Alphege. To gain an impression of what Malvern House is like today see the picture below and click website below. Untangling the complex history of the development of Malvern further, our investigations into the medieval period have yielded further clarification of the ancient origins. The bulk of the estate lies in the Manor of Longdon but does not appear as Malvern in the Domesday records circa 1080. Evidence in the 14th century indicates that the name Malvern Farm is associated with a Simon de Malverne (Assize Rolls 1317). He was Lord of the Manor and assassinated in 1317. A moated site opposite the end of Marsh Lane is believed to be the de Malvern former home. Malvern Farm is the first identified use of the Malvern label and originated when the region was being developed for farming. Was Simon de Malverne's family origin Malvern in Worcestershire? If so were they responsible for the adoption of the Malvern name in Warwickshire, perhaps not wishing to loose the name association when they relocated from Worcestershire to Warwickshire? Interesting coincidences link Malvern Warwickshire with Great Malvern Worcestershire. 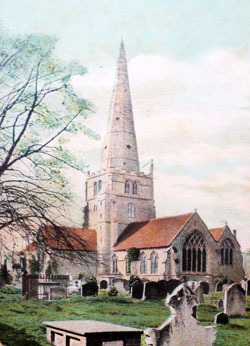 According to John Hannett in 'The Forest of Arden' (1863), St. Alphege, who is commemorated in the naming of the parish church, came from a noble Saxon family. He was brought up in the monastery at Deerhurst in Gloucestershire but was stoned by Danes in the year 1012. St. Werstan who founded Great Malvern Worcestershire was contemporary ascetic with Alphege and was also from Deerhurst. Could it be that the second Malvern sought to adopt a saint with similar background to the original? The earliest evidence of a church on the Warwickshire Malvern site is not until 1220 based on dating the earliest portions of the present day church. Building had first commenced in 1180. 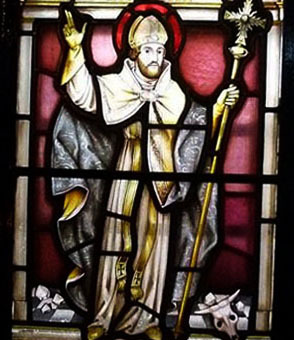 St. Alphege as patron saint dates from then suggesting that the saint was adopted because of his similarity with the founder of Malvern Worcestershire, St. Werstan. In addition, the Chantry called le Holywalle, founded in 1277 by William de Oddingeseles at Malvern, Warwickshire's church, was on a land endowment that included a spring known variously as Haliwell (Holywell) or St. Alphege's Well. The identification of the now ruinous building as containing the Holy Well is not until 1891 but both geological evidence detailed by David Patterson and the age of the ruin from archaeological evidence support this view. This subsequently provided the motivation for the chapel of St Alphege on the north side of the church. Malvern Worcestershire has a Holywell in the Malvern Hills which is known to have been active in medieval times. 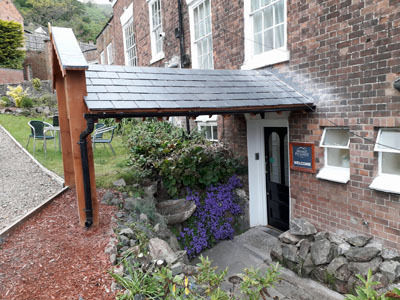 These two Holywells gives further support to the hypothesis that Malvern Worcestershire was the inspiration for the founding of the church and the establishment of Malvern as a locality originating from the medieval Malvern Farm. Picture left - St Alphege in Greenwich where he was martyred. Click left for more details on St Alphege and right for St Werstan in our newsletter 75. So what can be seen today in Warwickshire's Malvern? The Malvern Farm residence still exists as a private home and dates from the 16th century. Malvern Hall is a girl's school as detailed above. Malvern House is a partially occupied commercial premises. Malvern Park is a large public recreation area. In addition the parish church st Alphege's lies at the top of what was once known as Malvern Hill. Our thanks to David Patterson and the many others who have helped to research the above.